A great contest played in exceptional spirit and sunshine. A day for the purists! Wymondham got back to winning ways in the morning sunshine at local rivals Holt. With half term holidays and the sickness bug reducing numbers to 18 players Wymondham would have their work cut out for sure against an always competitive Holt team. The game started brightly, in bright sunshine for Wymondham nearly capitalising on an early handling error from the home team. However, that would be the last foray into Holt territory for the next 15 minutes! Inviting pressure on our selves and failing to clear our lines when we had the opportunities could have been more costly, however resolute defensive work and some great cover tackling kept honours even. Holt were the only team looking likely to score and with 20 minutes played there was still no score, both teams snuffing out each other and Wymondham definitely on the back foot. Finally a breakthrough, towards the end of the half. After enduring countless Holt attacks a clearing kick is fumbled in midfield and Holt are offiside at the ruck. The penalty taken quickly by Finn Lane and passing to Ethan who sees the finest of gaps and cuts a great line to get himself beyond the defensive line of Holt and Wymondham have taken the lead, totally against the run of play. Very harsh on Holt, but we will take it. Only one score but this game is enthralling. A stern half time team talk about doing the simple things well and making better decisions pays off immediately with a quick fire try almost from the restart from Tyler collecting a loose ball and managing to breach the Holt defence. Another well worked backs move saw Wymondham extend their lead to 3-0, but the opposition hit back with two well taken tries of their own. 3-2 Game on! The game is still in the balance, the game has opened up and it is going to be who can use the space the best as to who will triumph! Some more great defending from both teams but finally Wymondham get another breakthrough with Tyler, (now playing centre) getting over in the far corner after some great recycling work from both backs and forwards on the near side. And Ethan gets his third of the day after exchanging passes with Finn and Wilbur and beating the full back to score. A three try cushion, but still no time to relax, Holt hit back and a quick penalty which releases their "big runner", Wymondham are not quick enough to get to him and he crashes over. The score is now 5-3, two minutes left, surely there is no comeback here. Wymondham manage to maintain possession and the game finishes in glorious sunshine to warm applause from all who watched! Great game, well played both teams. 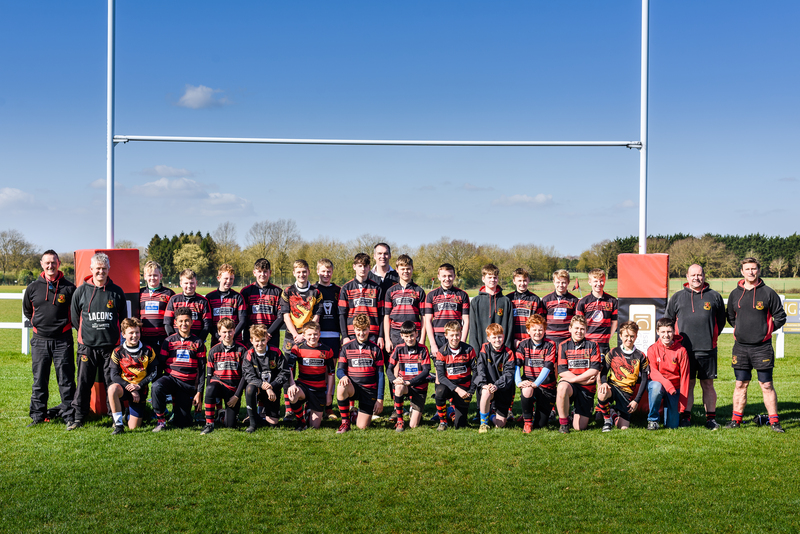 We look forward to welcoming Holt to Wymondham on march 3rd for the Eastern Counties competition, where we will lock horns with the best from Suffolk and Cambridgeshire. No man of the match today, well played all a great squad effort again!